Hanshin Racecourse hosts its second Grade 1 in as many weeks this coming Sunday (April 8), after a thrilling Grade 1 Osaka Hai last week, when Suave Richard became a new top flight champion. The Hanshin track, between the cities of Osaka and Kobe, and a stone’s throw from Osaka’s Itami airport, has long been the venue for the first Classic of the year, the Grade 1 Oka Sho (Japanese 1000 Guineas). This year sees the 78th running of the race, run over a mile on the outer turf course, which is fairly level throughout, until the final uphill push from the 200 meter mark to the winning post. Competition among the 3-year-old fillies looks stiff, with there being twenty five nominations for a maximum field of eighteen come Sunday. The horses carry a set weight of 55kgs, and a prize money boost this year means 105 million yen awaits for the first filly to cross the line in this year’s race. 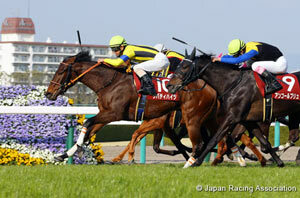 Lead up races to this year’s Oka Sho (Japanese 1000 Guineas) include three races run in March. 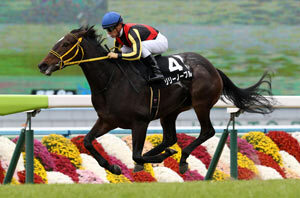 They are the Grade 2 Hochi Hai Fillies’ Revue at Hanshin over 1,400 meters (an official Guineas trial), the Grade 2 Tulip Sho, also at Hanshin over 1,600 meters, and the Open Class Anemone Stakes over 1,600 meters at Nakayama. Harp Star and Apapane tie the race record when they posted the time of 1 minute 33.3 seconds in 2014 and 2010 respectively, and both those fillies were sent off first favorite, Harp Star being the last favorite to win the race. There have only been three market leaders to win in the last ten years, and the race occasionally throws up a winner at a big price, as in last year, when Reine Minoru struck at 40/1. Everyone hopes the cherry blossoms will just stick around another week to provide the perfect backdrop to the race that takes their name. 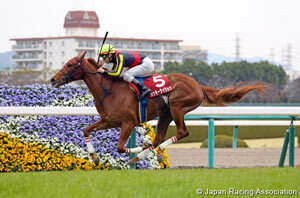 The Oka Sho (Japanese 1000 Guineas) will be Race 11 on the card at Hanshin on Sunday, with a post time of 15:40 locally. 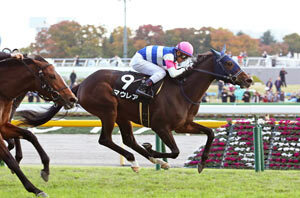 Almond Eye: The likely big race ride for jockey Christophe Lemaire, the filly by Lord Kanaloa will go into the race having won the Grade 3 Nikkan Sports Sho Shinzan Kinen in January, over 1,600 meters at Kyoto. Trained by eleven times Grade 1 level race winning trainer, Sakae Kunieda, who sent out Apapane to win in 2010, the trainer has a good prospect in Almond Eye. “She’s not always a fast starter, but last time she settled well, and even in the wet, she was able to display a turn of foot to win her race. 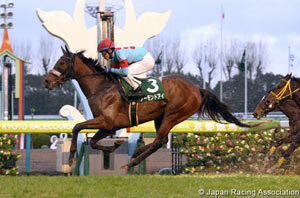 Since then she’s had her usual break at Northern Farm Tenei,” the trainer said.